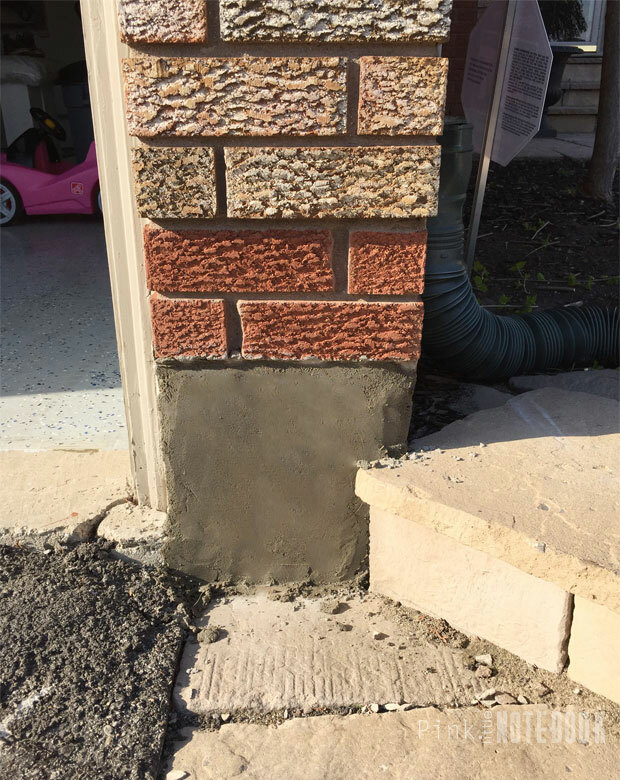 As you recall from my previous post, each week I’ll be sharing a different outdoor project as we update the exterior of our home. Today I’m starting off with the simplest repair of them all—patching the damaged concrete foundation. 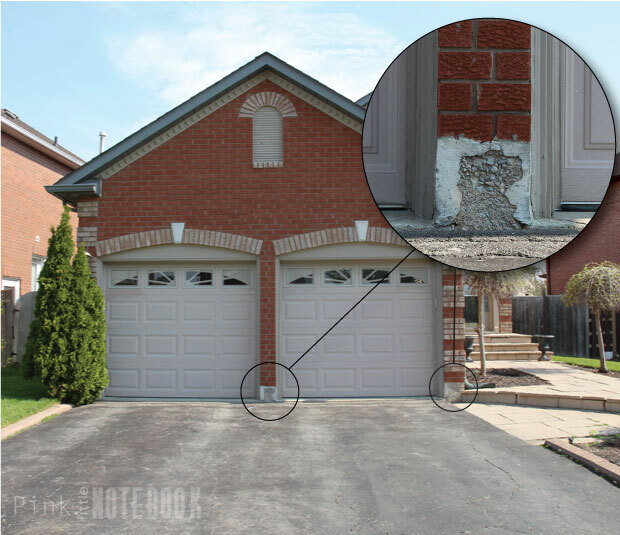 As highlighted in the image, you’ll see the majority of the water damage is located in the middle and on the right side of the garage doors. 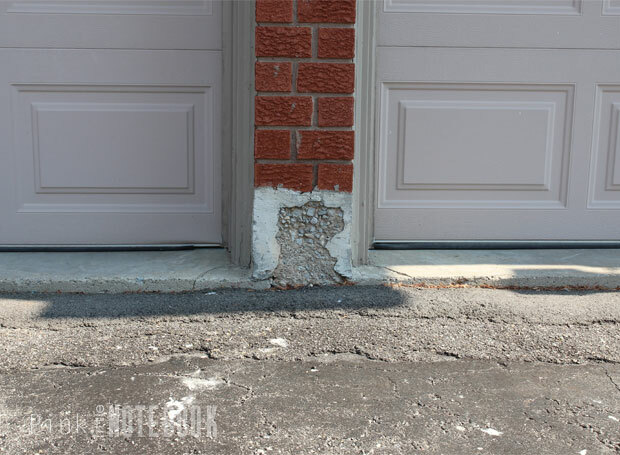 You’ll notice the deteriorating concrete has a crumbling and/or chipping effect, this is known as scaling. Scaling is the general lost of surface mortar that is exposed to freezing and thawing. It does not necessarily threaten the integrity of our home’s foundation, but like anything left untreated over a long period of time, it can lead to a more serious issue. Patching such surfaces is a simple task and an important part of keeping the concrete in good repair. 1. Using either a screwdriver or hammer (or a combination of both), chip off any loose concrete, paint, or old filler. 2. Get rid of any dust and debris with a wire brush. 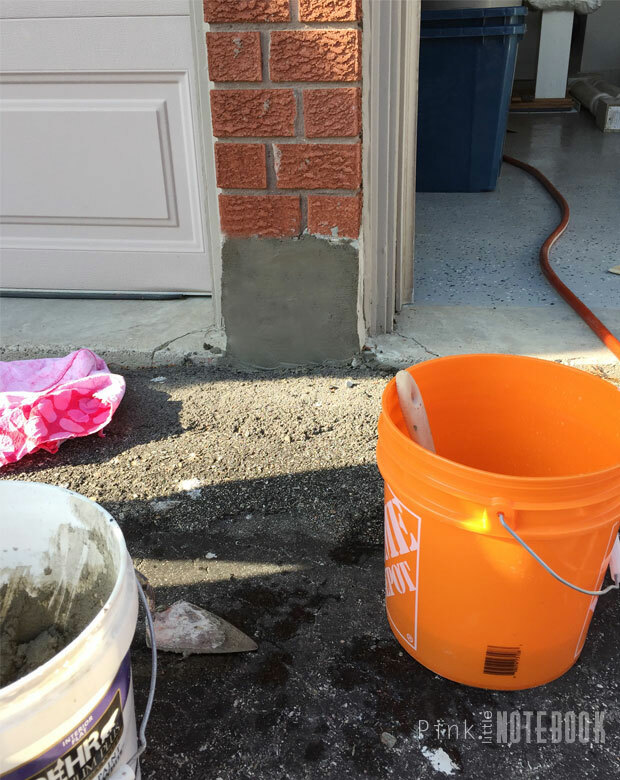 You want to make sure your new coat of concrete has a strong steady hold to the old surface. 3. 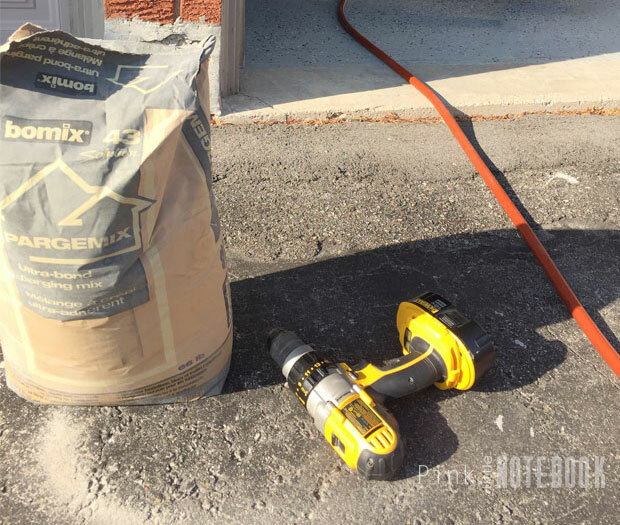 There are so many products available to patch concrete and you should pick one according to your project’s needs. We used an Ultra-Bond Purging Mix. Be sure to follow the mixing instructions on the back of the product. 4. Trowel the concrete onto the surface until it’s completely filled. 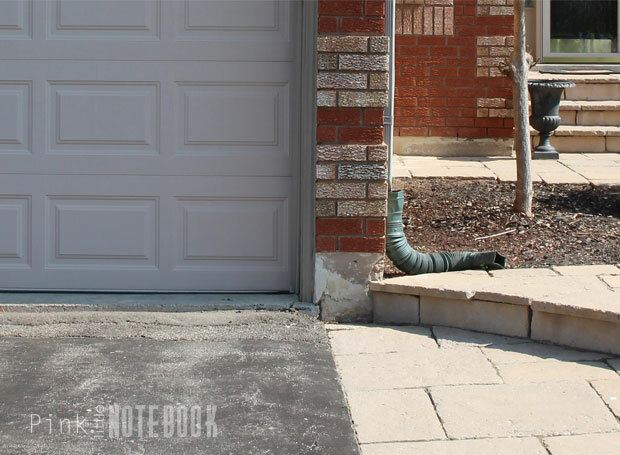 You may want to pat the concrete to compact the material and to remove any voids or air pockets that may have formed. 5. Use a concrete float to smooth out the entire surface and let it dry. To increase your home’s curb appeal, you can also paint the concrete once it dries. We’ve left ours as is but one day I would love to paint the exterior foundation wall around our home. 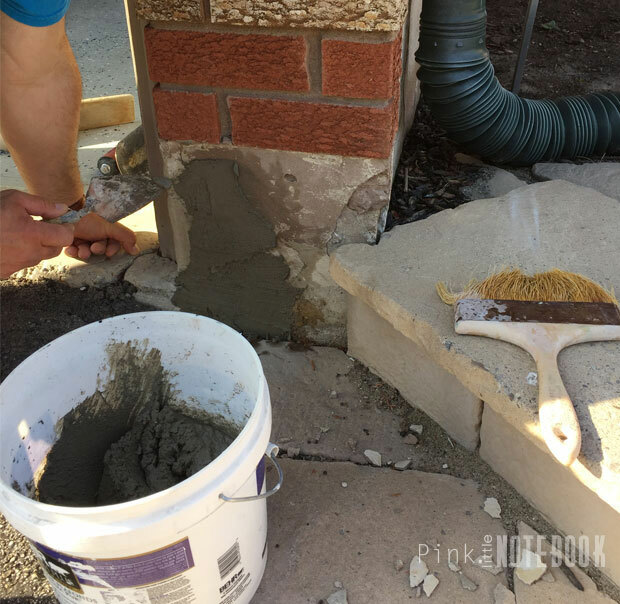 Have you done any concrete repairs? What has been your experience? *Click through these links to see more about our exterior makeover: Updating our Curb Appeal, Our new Garage Doors, Fixing a Walkway with Sinking Stones, Reviving our Exterior Front Entrance, Exterior Update, How to Renew your dated Driveway & Curbs, Five Ways to Upgrade your Front Door, Exterior Makeover: Before & After. The repair actually looks really good. Knowing how to fix certain things around the house is very beneficial. This is great! I’ll use this for my home if I encounter this issue! Great tips! I didn’t realize it’s so doable on your own. I need to repair my homes foundation as well. Thanks for the tips on how to do it. I will follow these instructions once I gathered all the materials. Thanks for the tips! That’s a great home repair! My husband and I have some small parts of concrete that we would love to get fixed, but we don’t know what to do. That is a great idea to use a wire brush to get rid of any dust or debris before we put the new concrete on the wall and sidewalk! That would help the new concrete stick for sure! Thank you for the information!